David Letterman Launches Record Label. Seriously. Everybody’s in a band these days. Everybody owns a label these days. The newest addition to the music label ranks is David Letterman’s new venture called Clear Entertainment/C.E. Music, a subsidiary of Worldwide Pants, Inc. production company, which will release the self-titled debut for the pop-punk group called Runner Runner later this summer. First of all, what kind of BS genre is pop-punk? It’s a complete oxymoron. I already don’t like it. Secondly, is owning a record label the latest trend du jour? Every blog of importance seems to have one now and it seems to be crossing into the celebrity sphere. I fear this is heading down a dangerous and misguided path. Like the en vogue trend of actresses launching their own fashion/makeup/ fragrance lines. Just because you’re pretty and dress well, does that mean you should design clothes too? I don’t know. But it all seems to be a bit much. 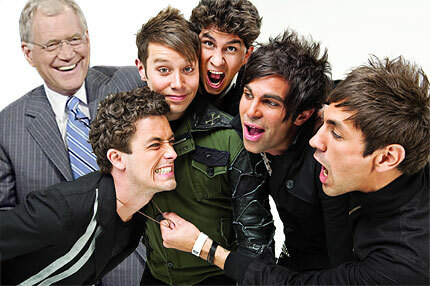 One thing for sure about Letterman, he has the eyeballs and the media power to truly make a difference for a band. So more power to him. Too bad he doesn’t have better music taste. Take a listen to his pick and see if you agree. You are so right. Just because people are famous or have a lot of money doesn’t mean they have good taste in music. Same goes for all the celebrities…just because you dress good doesn’t mean you smell good. Besides they don’t even shop for themselves…they pay other people to do that! I’m pretty sure I’ve heard the same sound of Runner Runner on all the pop radio stations…I think if you are a group of guys with unoriginal haircuts and style and you scream into a mic…you are pop-punk.